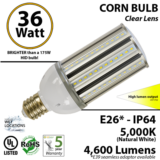 LED Corn Bulbs from 8W to 150W. Easy retrofit. 75% savings in electricity, labor and parts with 15 year lifespan. 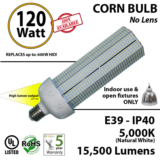 For use with any LED Corn Bulb, 22W to 150W. 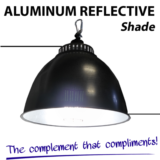 Reflective shades offered in acrylic or aluminum. Replace Metal Halide up to 400 Watts. Economy for open fixtures only or IP64 for sealed fixtures and outdoor use. 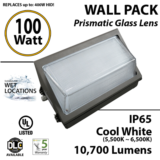 Wall Packs available from 30w to 100w. Frosted and clear, dusk to dawn, photo cell, cut offs and various color temps available. LED tube lights in 2ft, 4ft, 8ft lengths. 2-end connect and ballast compatible. 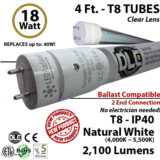 Replace fluorescents and save up to 75% in electric. 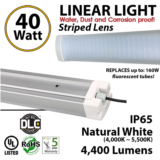 You can daisy-chain these tri-proof vapor tight indoor outdoor linear LED light fixtures. Striped or frosted lenses. IP 65. Sign up, no costs, no fees by clicking ledradiant.com/inquiry. Our approval process is lighting fast. If you are in immediate need, call us at 305-901-1313 to ask for on the spot approval. 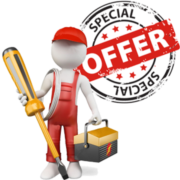 Once approved, you will be added to our Qualified Electrician Search and be able to buy at reduced prices from the first dollar. Pick up your products at our Hollywood Florida warehouse or have them shipped to you. We're located just a few minutes east of I-95, 3 blocks north of Hollywood Blvd. We look forward to getting to know you and helping you meet your business goals. We sent out this message to existing LEDRADIANT customers and electrical contractors with their permission. If you no longer wish to receive emails from this list, simply click on the following link to Unsubscribe. Â©2016 LEDRADIANT. All rights reserved.